Ok. Well that was weird. Every once in a while a film comes along that makes you scratch your head and Convergence is one of those films. This indie supernatural/psychological thriller is loaded with twists and because of this it is rather difficult to say much about the plot without giving important details away. Set in 1999, Clayne Crawford is an Atlanta detective, currently on maternity leave, who is called back to duty in the wake of a bombing at an abortion clinic. While investigating the scene he is caught in the middle of a second explosion. Ben wakes up in a hospital with his Captain (Williamson) sitting at the foot of his bed and curiously, not his wife or other family members. Ben is surprisingly unhurt by the incident although his captain stresses that he remain in bed. Ben decides to get dressed and explore the sparsely populated hospital. The first person he encounters is Nurse Delilah (Bruland) who has an over-the-top southern accent and is dressed in a nurse uniform that looks like it came out of the 50s or 60s. He soon finds his Captain speaking with a group of other people who also are dressed as if they are in the wrong decade. Esther is full on 1950s looking like June Cleaver while Isaac is attired in a 1970s-style leisure suit. There is another, more sinister group in the hospital. An EMT named Daniel (Embry) leads a group of cult-like followers who are trying to kill the rest in a bizarre ritual in which Daniel refers to himself as the “Hand of God.” Even more disturbing are the vaguely humanoid forms made out of black mist that terrify both groups. Convergence is all about mysteries. Some of them will be figured out early on, others, such as the final twist, take you by complete surprise and cleverly brings almost everything together. On the other hand there are a number of questions that are never sufficiently answered. Director Drew Hall seems to have been able to drop the bombshell of the last twist, hoping most viewers forget about other unresolved points. Convergence can be heavy-handed at times with its themes of redemption. It reminds me of the 1944 classic “Between Two Worlds” which centered on a similar theme but did it more skillfully. A more subtle approach would have helped the film hold onto its secrets a bit longer. Crawford is painfully bland and his character is not particularly bright, especially for a detective. Conversely, Ethan Embry is terrifying as the self-proclaimed Hand of God. Known early in his career for his lighter comedic roles, he has recreated himself in several horrors/thrillers over the past ten years and at is at his best in Convergence. Also on hand to lend a steadying presence is Gary Grubbs, a veteran character actor whose TV and film credits include everything from Happy Days and M*A*S*H to Glee and Project Almanac. Hall has made an extremely ambitious movie and while not note is hit in perfect tune for those seeking something different Convergence certainly fits the bill. 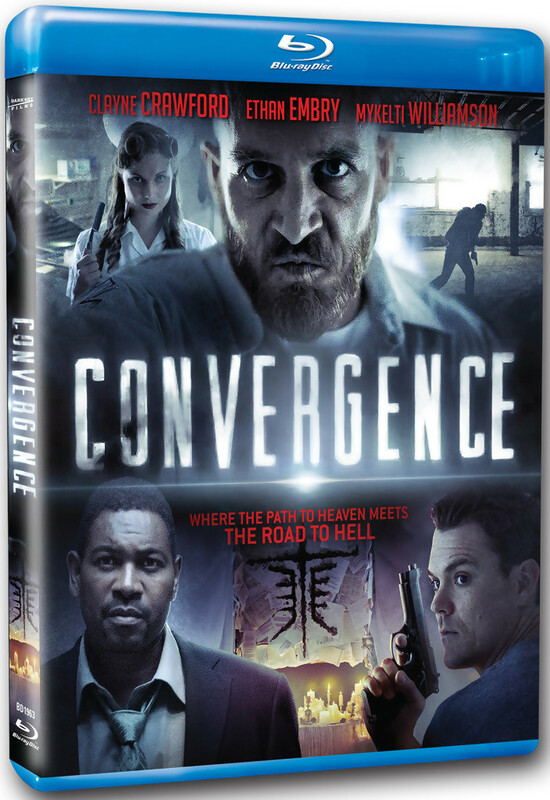 This ambitious supernatural/psychological thriller is filled with twists that don't always work but Convergence is still a unique film.